Is there evidence that others besides Enoch’s people were translated? How can we tell our children’s nonmember friends that our children can’t play on Sunday? Was Martin Harris ever excommunicated from the Church? This multistake fireside that brings you together each month is the largest in the Church, and it is an honor to be invited to address you. I have a deep awareness of the responsibility associated with this honor and therefore seek the guidance of the Spirit and pray that I might have utterance to portray to you some of the thoughts that are on my mind. Brigham Young University is distinctive. It is, as it were, a gathering place for children of our Father from many nationalities and cultures around the world. The campus and those who come here are testaments to the truth that the gospel of Jesus Christ transcends nationality and color, crosses cultural lines, and blends distinctiveness into a common brotherhood. This is the way the Church feels about each one of you﻿—and it is about this common brotherhood that I wish to speak. “And he inviteth them all to come unto him and partake of his goodness; and he denieth none that come unto him, black and white, bond and free, male and female; and he remembereth the heathen; and all are alike unto God, both Jew and Gentile” (2 Ne. 26:33). From this statement it is clear that all men are invited to come unto him and all are alike unto him. Race makes no difference; color makes no difference; nationality makes no difference. The brotherhood of man is literal. We are all of one blood and the literal spirit offspring of our eternal Heavenly Father. Before we came to earth we belonged to his eternal family. We associated and knew each other there. Our common paternity makes us not only literal sons and daughters of eternal parentage, but literal brothers and sisters as well. This is a fundamental teaching of The Church of Jesus Christ of Latter-day Saints. “And [God] hath made of one blood all nations of men for to dwell on all the face of the earth, and hath determined the times before appointed, and the bounds of their habitation” (Acts 17:26). The words “hath made of one blood all nations of men” refer to Adam, the mortal father of the nations of men. The whole human race is the offspring of one man. Paul said that by divine plan the offspring has been scattered over the earth at the “times before appointed”﻿—that is, the period fixed by God for the several families to go into the countries where he decreed they should dwell. Not only did God determine the times when they should go, but also the “bounds of their habitation.” or, in other words, the countries where they should dwell so that their posterity might carry our the Lord’s divine purposes. “When the most High divided to the nations their inheritance, when he separated the sons of Adam, he set the bounds of the people according to the number of the children of Israel” (Deut. 32:8). This would indicate that the Lord separated the offspring of Adam into nations and at the same time provided an inheritance for the children of Jacob. “But in every nation he that feareth him, and worketh righteousness, is accepted with him” (Acts 10:34–35). Peter had been of the opinion that only Jews were in the favor of the Lord and that Gentiles were not as acceptable. Before he had even met Cornelius, though, a vision was shown him, and he saw plainly that God was not partial. No nation or people or individual could expect to be favored above another. First: All men on earth are of one blood﻿—we stem from common ancestors, Adam and Eve. Second: God, our Father, in his omniscient wisdom, determined premortally the nation in which we were to live. Third: Nationalities are apparently circumscribed in relation to the House of Israel. Fourth: Our Father does not favor one people over another, but accepts all those of every nation who fear him and work righteousness. A present prophet has renewed this great challenge to the leaders of the Church. In addressing the Regional Representatives, he said: “The scriptures are replete with commands and promises and calls and rewards for teaching the gospel. I use the word command deliberately for it seems to be an insistent directive from which we, singly and collectively, cannot escape. “These were his last words on earth before he went to his heavenly home. “‘All power is given unto me in heaven and in earth. “Again, his last command. Surely there is significance in these words! There was a universal need and there must be universal coverage. “As I remember the world as Moses saw it﻿—it was a big world. Several significant developments have taken place recently which will materially assist in accomplishing the commission to teach all nations. There has been revealed the timely need for building up the First Quorum of the Seventy. “The Twelve are a Traveling Presiding High Council, to officiate in the name of the Lord, under the direction of the Presidency of the Church, agreeable to the institution of heaven; to build up the church, and regulate all the affairs of the same in all nations” (D&C 107:33). “The Seventy are to act in the name of the Lord, under the direction of the Twelve or the traveling high council, in building up the church and regulating all the affairs of the same in all nations” (D&C 107:34). “It is the duty of the traveling high council to call upon the Seventy, when they need assistance” (D&C 107:38). “Then the twelve called the multitude of the disciples unto them, and said, It is not reason that we should leave the word of God, and serve tables. “Wherefore, brethren, look ye out among you seven men of honest report, full of the Holy Ghost and wisdom, whom we may appoint over this business. “And the word of God increased; and the number of the disciples multiplied in Jerusalem greatly; and a great company of the priests were obedient to the faith” (Acts 6:7). First: That the Twelve determined they were not to “serve tables” or, in other words, occupy their time in the details of administration. Second: They appointed seven men, “full of the Holy Ghost and wisdom,” to look after the day-to-day needs. Fourth: The word of God increased, and the gospel was carried to greater numbers. 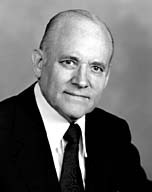 In December 1978, the First Presidency and Quorum of the Twelve made a similar determination that it was no longer advisable for the Twelve to occupy their time in the details of administration of the many Church departments. They delegated seven men, designated as the presidents of the First Quorum of the Seventy, to give supervision to these details so that the Twelve could devote their full energies to the overall direction of the work, and, as directed by the Doctrine and Covenants, “To build up the church, and regulate all the affairs of the same in all nations” (D&C 107:33). I fully believe that in the near future we will see some of the greatest advancements in spreading the gospel to all nations that have ever taken place in this dispensation or any previous dispensation. I am sure that we will be able to look back in retrospect﻿—as a result of the decision recently made﻿—and record as Luke did, “And the word of God increased” (Acts 6:7). Another significant development of recent date is the revelation on extending priesthood blessings to all worthy male members, regardless of race or color, which will assist also in accomplishing the commission to teach all nations. Gradually nations are opening their doors, and the areas of the earth to which the gospel is being carried are increasing. With approximately 28,000 missionaries, more than at any time in the past, teaching is being increased. Missionaries are now extending the work to the west as far as Thailand, which leaves only Burma and Pakistan, to India, on the backside of the world. To the east there are missionaries as far as Iran, with only a short gap to India. They almost circle the globe. From these revelations and developments, it should be manifestly evident to members of the Church that our Father loves all of his children. He desires all of them to embrace the gospel and come unto him. Only those are favored who obey him and keep his commandments. As members of the Lord’s church, we need to lift our vision beyond personal prejudices. We need to discover the supreme truth that indeed our Father is no respecter of persons. Sometimes we unduly offend brothers and sisters of other nations by assigning exclusiveness to one nationality of people over another. Let me cite, as an example of exclusiveness, the present problem in the Middle East﻿—the conflict between the Arabs and the Jews. We do not need to apologize nor mitigate any of the prophecies concerning the Holy Land. We believe them and declare them to be true. But this does not give us justification to dogmatically pronounce that others of our Father’s children are not children of promise. We have members of the Church in the Muslim world. These are wonderful Saints, good members of the Church. They live in Iran, Egypt, Lebanon, Saudi Arabia, and other countries. Sometimes they are offended by members of the Church who give the impression that we favor only the aims of the Jews. The Church has an interest in all of Abraham’s descendants, and we should remember that the history of the Arabs goes back to Abraham through his son Ishmael. Imagine a father with many sons, each having different temperaments, aptitudes, and spiritual traits. Does he love one son less than another? Perhaps the son who is least spiritually inclined has the father’s attention, prayers, and pleadings more than the others. Does that mean he loves the others less? Do you imagine our Heavenly Father loving one nationality of his offspring more exclusively than others? As members of the Church, we need to be reminded of Nephi’s challenging question: “Know ye not that there are more nations than one?” (2 Ne. 29:7). At the present time we are engaged in a project of beautifying the Mount of Olives in Jerusalem by a garden, in memory of Orson Hyde, an early apostle of the Church, and the dedicatory prayer he offered on that site. It is not because we favor one people over another. Jerusalem is sacred to the Jews, but it is also sacred to the Arabs. A cabinet minister of Egypt once told me that if a bridge is ever built between Christianity and Islam it must be built by the Mormon Church. In making inquiry as to the reason for his statement I was impressed by his recitation of the similarities and the common bonds of brotherhood. To our friends of Judah, we say: We are your brethren of the house of Joseph﻿—we feel a close relationship to you. We are messengers of the true covenant and bear a message that God has spoken in this day and time. To our kinsmen of Abraham, we say: We are your brethren﻿—we look upon no nation or nationality as second-class citizens. We invite all men to investigate our message and to receive our fellowship. As our Father loves all his children, we must love all people﻿—of every race, culture, and nationality﻿—and teach them the principles of the gospel that they might embrace it and come to a knowledge of the divinity of the Savior. Only they are favored who keep his commandments. I know that God is our eternal Heavenly Father, and that his son, Jesus Christ, is the Savior of the world. We will receive blessings and find exaltation by following him, keeping his commandments, having love for and teaching all nations. In the name of Jesus Christ. Amen.